The TC Electronic Pipeline Tap Tremolo Guitar Effects Pedal offers up vintage warmth that we've all come to know and love, and marries it with a modern vibe that makes this perfect for any musical style. From soft sine waves to hard square waves available at the flick of a switch, and up to 6dBs of boost ready and waiting, you can rest assured that you will never sound thin or flat. As the name would suggest, the footswitch is tap tempo-enabled so that you have real-time tempo control, whilst the Subdivision knob allows you to splice the tempo into several rhythmic accents to play with. As noted above, the footswitch offers tap tempo control to save on space and increase functionality. Simply hold it down for two seconds until the light switches to green, then you have tap functionality. Simple yet highly effective. Then you can use the Subdivision knob to adjust the tremolo to have the perfect amount of stutter to suit your performance, and you're sorted. As well as the True Bypass footswitch and Subdivision knob, you'll find the Speed, Depth, and Volume knobs, as well as a Vintage/TonePrint/Square mini-toggle switch. The Speed knob defines the speed of the tremolo oscillation from sweet lilting tides to stormy waves. The Depth knob dictates how deeply the tremolo sweeps into the volume, giving you everything from smooth and sweet to jagged gnarliness. The Volume knob allows you to boost your signal by up to a whopping 6dBs, enabling you to account for any perceived drop in audible volume (though be careful to remember that the signal is measurably the same). The mini-toggle switch offers rapid adjustment between swirling sine waves and block-like square waves. The TonePrint position pulls in your own personal creation - or one of your selected artist TonePrints. By now I think we are all aware of TC Electronic's awesome TonePrint tech, but for the uninitiated, here is a brief overview. TC's TonePrint editor allows you to dive deep into the world of patch editing, and enables you to create your own TonePrint's from scratch. 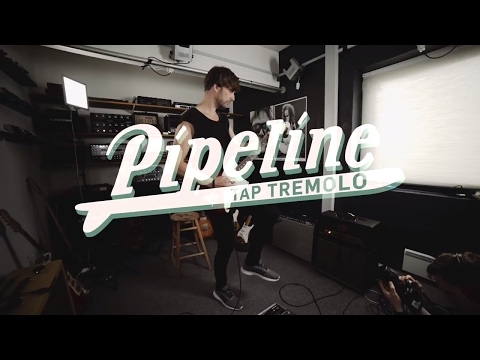 In the case of the Pipeline Tap Tremolo, you can control effect behaviour, knob ranges, and everything in between. Alternatively, you can select one of TC Electronic's many TonePrints that have been created by some of the world's top artists. If you download the free TonePrint app for Android or iPhone, you can quite literally beam your selected TonePrint from your phone to your pedal via your guitar's pickup. No messing about!